Massaman curry hails from the south of Thailand and is different from other Thai curries—you can easily detect an Indian influence, notably in the addition of Indian spices such as cardamom, cloves, and nutmeg. At the same time, Massaman is also distinctly Thai and has been a traditional part of the cuisine for hundreds of years. Use this warm and flavorful curry paste to create a wonderful chicken, beef or lamb Massaman curry—or even a delightful vegetarian curry by adding wheat gluten or tofu plus lots of vegetables. You can cook with it immediately or store in the refrigerator or freezer for later use. This recipe calls for palm sugar, which is derived from the sap of the sugar palm tree. Similar to maple syrup, the sap is boiled down to create either rock-like chunks or a paste. You can find palm sugar in Asian markets and health food stores, but feel free to substitute brown sugar. Place all paste ingredients in a food processor or blender and process well. To make a sauce rather than a paste, add up to 1 can coconut milk. Place​ the paste in a casserole or baking dish with your choice of chicken, beef, lamb, or tofu/wheat gluten, plus vegetables. Add 2 to 3 whole bay leaves if you have them (this is a common ingredient in Massaman curries). Stir well to combine, cover, and bake in the oven at 350 F, or simmer in a wok, until cooked through. Garnish your Massaman curry with whole roasted peanuts and fresh coriander. Lime wedges can also be served if your curry is on the salty side. 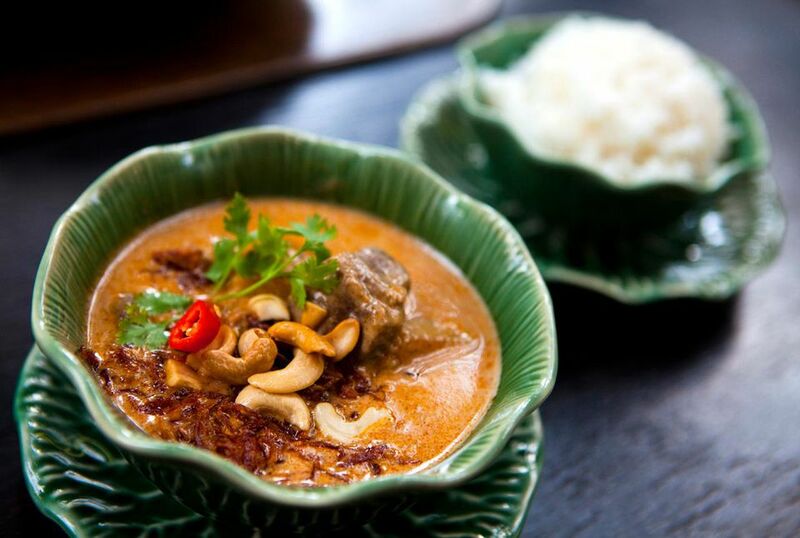 For a complete recipe, see Thai Massaman curry. Curry paste can be stored in a jar or other covered container in the refrigerator for up to 2 weeks; freeze thereafter. When ready to use, add coconut milk to make a sauce, then add your curry ingredients.